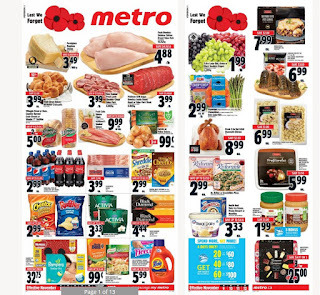 Metro flyer this week - November 9 - 15 , 2017 ,Parmigiano Reggiano Cheese $3.49 100 g Sale Price $1.00 Savings Deli cut. $15.83 lb. 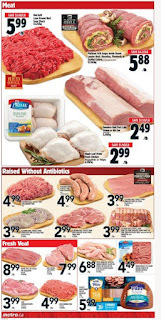 Front Street Bakery All Butter Croissants $3.99 Sale Price $2.00 Savings Pkg of 12, 600 g. New Zealand Fresh Lamb Shoulder Chops Value Pack Regular Or Mediterranean $3.99 lb Sale Price Up to $3.10 Savings $8.80 kg. 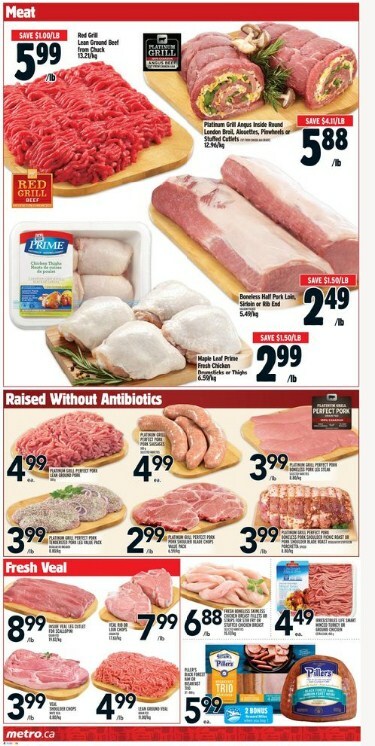 Platinum Grill Angus Boneless Inside Round Roast Or Value Pack Steak $3.99 lb Sale Price $5.00 Savings Cut from Canada AAA grades. $8.80 kg. Villaggio Bread Or Buns, Country Harvest Grain Breads Or Wonder 7" Tortillas $2.99 Regular Price 2 $5.00 Sale Price Up to $2.78 Savings Selected sizes. Selected varieties. Carrots Or Yellow Onions $0.99 Sale Price 3 lb. Product of Ontario. Canada no. grade. Foodland Ontario. 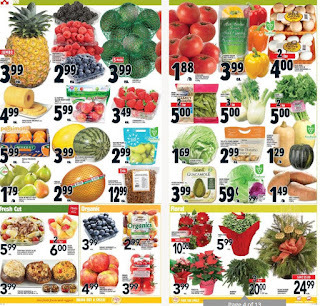 Villaggio Bread Or Buns, Country Harvest Grain Breads Or Wonder 7" Tortillas $2.99 Regular Price 2 $5.00 Sale Price Up to $2.78 Savings Selected sizes. Selected varieties. 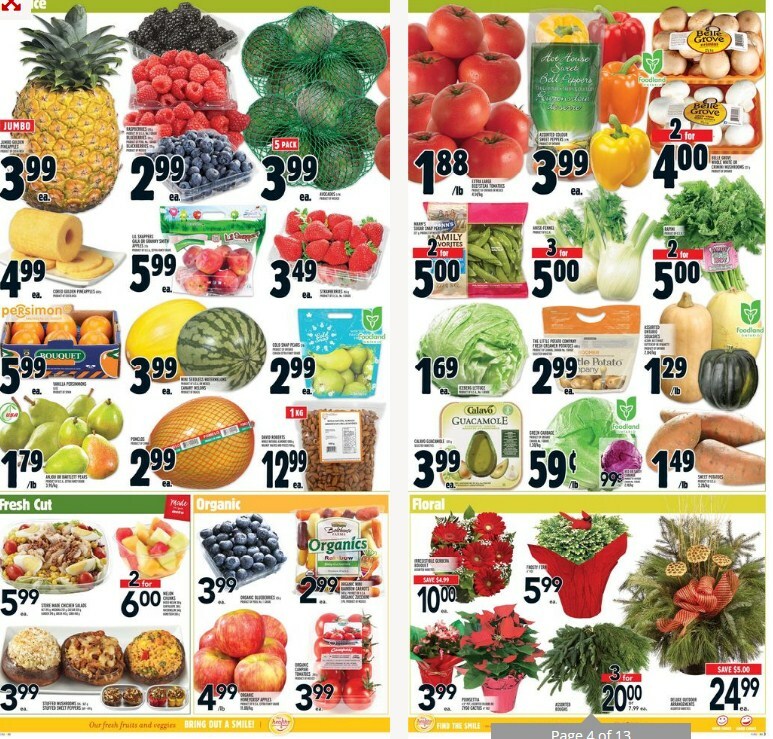 Fresh Coho Salmon Fillets Or McKinnon's Smoked Salmon $9.99 lb Sale Price Up to $10.00 Savings Fresh coho salmon fillets 2.21 100 g. Mckinnon's smoked salmon frozen, 300 g.
Schneiders Bacon $3.99 Sale Price $3.00 Savings 375 g. Selected varieties. General Mills Cheerios, Post Cereal $2.99 Sale Price Up to $2.70 Savings General mills cheerios 340-500 g. Post cereal 365-550 g.
Selected varieties. Ruffles Chips Or Cheetos $2.99 Sale Price Up to $0.80 Savings Selected sizes. Selected varieties. Danone Activia Yogurt $3.33 Sale Price Up to $2.66 Savings 8 X 100 g. Selected varieties. Black Diamond Cheese Bars $4.44 Sale Price Up to $3.55 Savings 400-450 g. Selected varieties. Huggies Or Pampers Baby Diapers $32.75 Sale Price 92-198 un. Selected varieties. 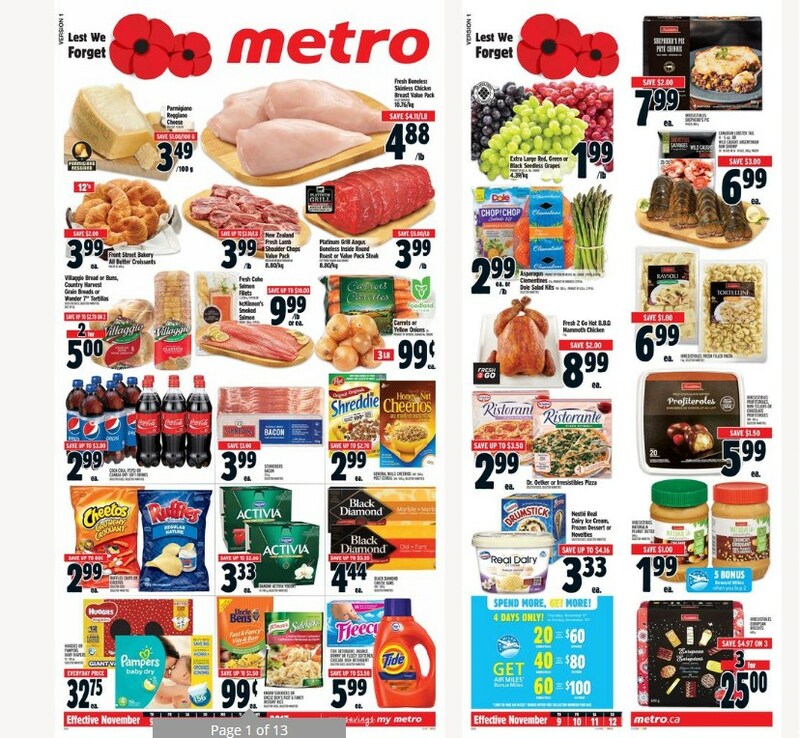 Huggies Or Pampers Baby Diapers $32.75 Sale Metro flyer Price 92-198 un. Selected varieties. Knorr Sidekicks Or Uncle Ben's Fast & Fancy Instant Rice $0.99 Sale Price Up to $1.50 Savings Selected sizes. Selected varieties. Tide Detergent, Bounce, Downy Or Fleecy Softener, Cascade Dish Detergent $5.99 Sale Price Up to $3.50 Savings Selected sizes. Selected varieties. Extra Large Red, Green Or Black Seedless Grapes $1.99 lb Sale Price Product of USA. No. 1 grade. $4.39 kg. Irresistibles Shepherd's Pie $7.99 Sale Price $2.00 Savings Frozen, 800 g.